The Indian Institute of Management Bangalore (IIMB), in collaboration with Toulouse Business School (TBS), France, today hosted an international conference on Future of Aviation & Aerospace 2018, a premier event for senior aviation and aerospace management professionals. The global meet, which was organized by IIMB’s Executive Education Programmes, witnessed the presence industry stalwarts and participants from major airline and aviation companies. 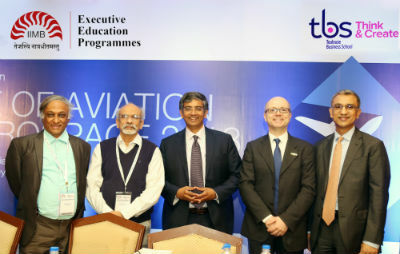 The conference was inaugurated by Prof. G Raghuram, Director IIM Bangalore, Dr. Dwarkanath, President, AIRBUS India; Vinay Dube, CEO, Jet Airways; Dr. Raghunath S, faculty and Conference Chair, IIM Bangalore and Dr. Christophe Benaroya, TBS France. Dr. Christophe Benaroya, from TBS France, said: “As much as policies are important for the sector, working with the right set of talent, managers and ability to incorporate the management culture in the industry plays a key role.” He added that the industry requires more start-up contribution, innovation and fresh talent, not limiting itself to engineers. Dr. Raghunath S, faculty at IIMB and the Conference Chair, explained that the programme offered jointly by IIMB and TBS seeks to address the very needs that Dr. Benaroya had listed. There were panel discussions on ‘Next Growth Opportunity’, ‘Managing Talent in the Industry’ and ‘Driving Real Insights Through Additive Manufacturing (AM), IOT and Big Data’. A special panel on ‘Startups: Their Role & Contribution to Aerospace & Aviation Industry’ drew attention to the fact that the big firms were mentoring startups by giving them real time projects. 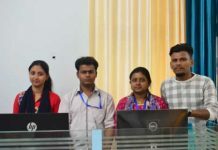 Therefore, for startups in the sector, identifying the right team and stakeholder to take the technology forward, turnaround time, and budgets for the technologies are some of the key challenges. The day came to an end with a vote of thanks, delivered by Dr. Raghunath S, faculty at IIMB and the Conference Chair.